Characterized by a freshwater ecosystem in which organisms depend upon each other and the immediate environment, the pond habitat relies on a variety of different plants. To protect the pond environment, all plants should be healthy and suitable for the local climate. credit: "Two of a kind" is Copyrighted by Flickr user: aussiegall (Louise Docker) under the Creative Commons Attribution license. A pond ecosystem typically contains algae, fungi, microorganisms and fishes. These organisms exist alongside plants in four basic levels of the pond: shore, surface, open water and bottom water. 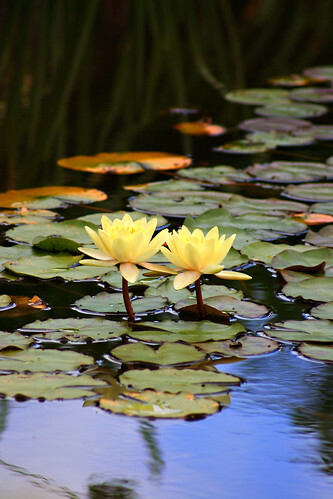 Oxygenating plants are crucial to the health of a pond. Pond weed, parrot's feather and arrowhead consume carbon dioxide and release oxygen, creating a healthy environment, especially for fish. One potential problem is the proliferation of algae, which can overrun other organisms, depriving the pond of sufficient amounts of carbon dioxide and poisoning the habitat. To limit algae growth and promote balance, a pond should contain floating plants on the surface of the water. These include pond lilies, tropical lilies (both day and night), water lettuce and water hyacinths. Lotus and sagittaria prosper in bog environments, and plants for pond margins include: cattails, dwarf bamboo, marsh marigold, ostrich ferns, lady ferns, ribbon grass and pickerel rush. Never plant invasive plants (such as purple loosestrife or Canadian pond weed) if you live near a natural body of water. Check all plant purchases to see if they are invasive by seed or root. Kehan DeSousa is currently a Fulbright English Teaching Assistant in the Slovak Republic. She graduated from Oberlin College with a double major in English and Politics. Kehan has written for the Oberlin Alumni Magazine and Drivel, Oberlin College's humor magazine, as well as for her blog of cultural criticism.